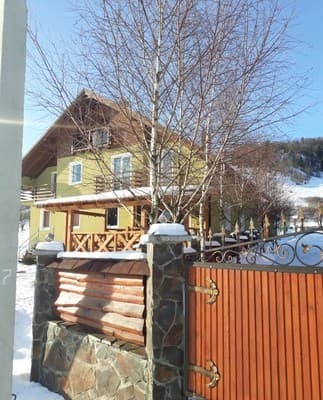 Villa Riсhka is located in a beautiful place surrounded by mountains, 10 km from the Izky and Pylypets ski slopes and 100 meters from the river. 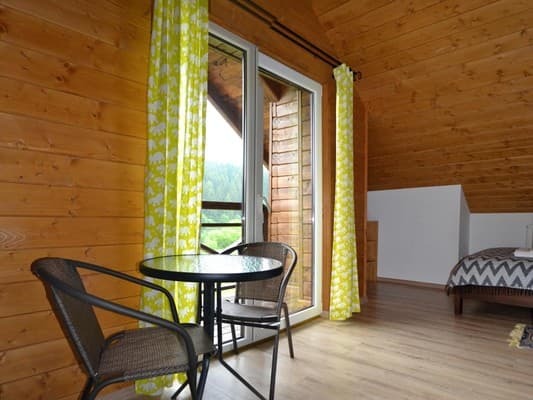 Each room holiday home "Villa River" is decorated in a rustic style with bright colors. All rooms have a flat-screen TV and private bathroom. There is a restaurant on the territory . The quests can relax on the porch overlooking the garden. Barbecue facilities are available. 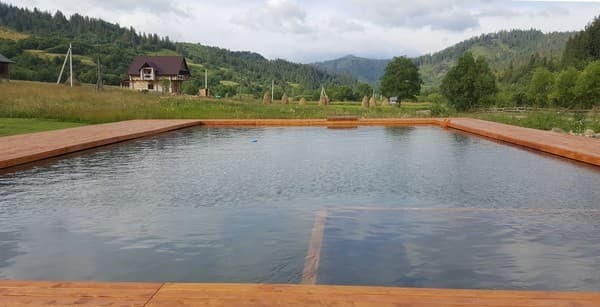 The biggest seasonal outdoor pool in the Carpathians and a sauna. Landmarks holiday homes are ideal for walking, cycling, fishing and horse riding. On the nearby ski storage. Waterfall Shepit 10 km and Synevir Lake is located 30 km from Villa Richka. Buses stop 100 meters away, and the train station Volovets can be reached by car in 30 minutes. Uzhgorod Airport is just over 2 hours away from home to relax. 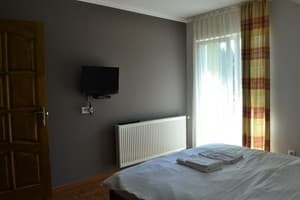 Description of the room: Double room with a large bed and a private bathroom. 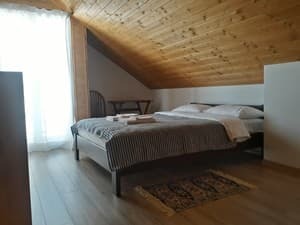 Description of the room: Comfortable triple room with private bathroom will give you a beautiful view of the mountains. 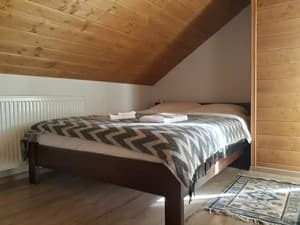 Description of the room: Cosy room in the attic. Wood trim in conjunction with the white color of the walls blend harmoniously with the amazing view from the window. Carpathian fir trees and the quiet flow of the river. 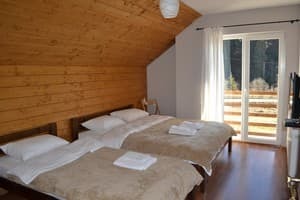 The room with 2 double beds. Отдыхали в этом месте первый раз. Я, жена и сын 1,5 года. Все было превосходно! И персонал, и комната, и еда, и отношение хозяев оцениваю в 10 из 10! Это чудесное место для отдыха с детьми, тут обустроено все для маленьких клиентов. Месторасположение отличное, тихое. Еда вкусная. Комнаты просторные, светлые и чистые. Одним словом ОТЛИЧНО! Часто бывают мелочи которые немного портят впечатление, но не сказываются на общем мнении о месте отдыха. Так вот в Вилла Ричка таких мелочей нет. Check arrival: from 14:00 - 22:00 hours. Check leaving: to 08:00 - 12:00 hours. Food is provided by prior arrangement. On the 1st floor of the hotel there is a kitchen for self-catering. 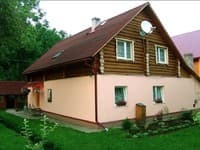 Coordinates: 48.594974,23.393537 Ukraine, Transcarpathian region, Mizhgirya district, village River. 3 km from Richka village, near the motorway Volovets-Mezhgorye Kelechyn in the village is a unique source of natural sparkling mineral water, which is used for drinking and bathing in diseases of the digestive organs and the cardiovascular system. 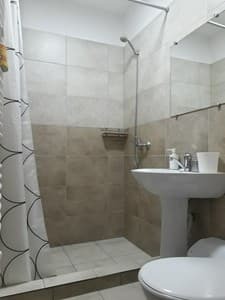 From Kiev: Option 1: Train "Kiev-Chop" to station Volovec; Train "Kyiv-Uzhgorod" to the station Volovets; Then by bus or taxi to the resort (30 km). Option 2: By car on the highway M06 Kiev-Chop to PPC with. Bottom Gate further rotation by smt. Volovec (14 km). After the village. Volovec left on the ring to Richka settlement (30 km). 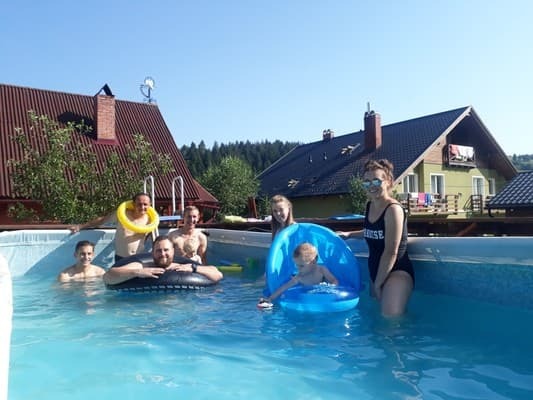 From Lviv: Option 1: By train: Lviv - Mukachevo to the station st. Volovets, then by bus or taxi to the base in the village of Richka (30 km) Option 2. By plane to the city of Lviv and Uzhgorod. From Lviv to the item. Richka 220 km - 2.5 hours in a car, from Uzhgorod to n. Richka - 125 km. From Moscow: By train "Moscow-Uzhgorod", "Moscow-Chop" to the station Volovets; Then by bus or taxi to the resort (30 km).